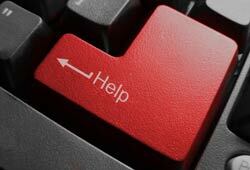 Are you wondering exactly how virtual assistance works? Continue reading below to find the answers to your questions! A Virtual Assistant (or VA) is a self-employed, independent contractor who provides a variety of business services from her own office. These services are performed remotely using all the latest Internet technology, along with fax, phone, and shipping services. Click here to learn more about the virtual assistance industry. First, please take some time to review the information on my website. Once you’ve done this, contact me by email or phone and we’ll set up an appointment for a free telephone consultation. During the consultation, we’ll discuss your business needs and the virtual solutions that I can provide. It may be necessary to set up a second interview to discuss additional questions. If we find that our work styles are compatible and you decide to retain my services, I will send you a service agreement so we can get to work! Do you perform all the work yourself? While I will personally complete most of your projects, it may be necessary to obtain outside help on occasion. If your projects involve sensitive or confidential information, I will always inform you before engaging a third party. You can rest assured that I work with only the most qualified and trustworthy virtual assistants in the industry, and have developed solid business and personal relationships with many of my subcontractors. What if I need a service you don't offer? I have access to a network of virtual assistants with a wide range of skills to meet your business needs. I can either subcontract the work to another VA while continuing to manage the project, or I can refer you to a qualified VA with whom you can work directly. Turn-around time depends on the complexity and urgency of each project. If your project is time sensitive, a deadline will be agreed on before work begins. I am committed to delivering all projects on or before the deadline, but will communicate with the client if a problem arises. Rush projects will only be considered on a case by case basis and are subject to a 20% rush order fee. Any projects that require evening or weekend hours will be charged a 40% after-hours fee. The Internet offers an amazing number of resources that make it easy for people to work together virtually. These resources range from email, instant messenger programs, remote desktop software, virtual collaboration sites, and various file transfer programs. If this sounds overwhelming, you can leave the details to me! I prefer to correspond via email whenever possible. You may also contact me by telephone, instant messenger, or fax. Will you visit my office to work on a project? I only provide services which can be done remotely from my own office. I do not take on projects which require client office visits or substantial time outside my office. What is your policy on ethics and privacy? • I shall always exercise integrity, honesty and diligence in carrying out my professional duties and responsibilities. • I shall safeguard the interests of my colleagues and clients, and shall not knowingly be a party to any illegal or unethical activity. • I shall enter into no agreement nor undertake any activity which may be in conflict or give the appearance of conflict with the legitimate interest of my client, or that would prejudice my capacity to perform my professional duties. • I shall protect any confidential information obtained in the performance of my duties, and shall not use such information for personal gain nor in a manner that would be detrimental to my client or any other party. • I shall continually ensure the currency of the knowledge, skills and technical competencies required to perform my professional activities. • I shall refrain from conduct or action which would detract from the reputation of the IVAA or the profession of Virtual Assistance as a whole. • I shall be mindful at all times of my responsibilities as a professional to the community at large. You have a very important meeting with a client coming up, and you don’t want to forget anything after it’s over. Simply use a digital recorder during the meeting, then email me the file. I’ll type up the meeting minutes for you, and you won’t have to worry about missing anything important again! "Angela’s attitude and willingness to learn are exceptional." "You are like the Rock of Gibraltar in that even in times of demanding deadlines and high stress you never seem to get your feathers ruffled." "You lead by example and that’s the most effective way." Don’t you wish your spell check program would alert you if you type here when you mean hear? Click here to read the Grammar Tips & Tidbits archive now! I use all the latest and greatest computer hardware and software to complete your projects, and I couldn't get by without my high-speed Internet connection! Please feel free to contact me if you have additional questions that aren't addressed here.